When the traveling light encounters a medium with a different refractive index, its direction of propagation changes. This light can both reflect, where the angle of reflected light equals the angle of incident light, or refract, where the angle of refracted light can be estimated with Snell's law. Moreover, at a specific angle, called Brewster's angle, the reflected light will be perfectly polarized. In the text below, we explain what light polarization is, how you can calculate Brewster's angle and where this effect finds an application. Light is an electromagnetic wave which consists of two oscillating fields: electric and magnetic. In general, those fields are always perpendicular to each other and can oscillate in all possible directions in space. This is the case of the unpolarized light. elliptical polarization - directions of the fields form an ellipse in the plane as light travels. n2 is the refractive index of the medium which reflects light. During bright days, the sunlight can reflect from water or road making us difficult to see. The solution to this problem can be found in polarized sunglasses, which use the Brewster's angle principle. Most of the reflected sunlight is linearly polarized and therefore can be blocked with appropriately polarized sunglasses. Phenomenon of polarization by reflection is also used in photography. Photographers can remove reflections from transparent surfaces (like water) to see objects beneath it by simply rotating the polarizing filter in the camera. 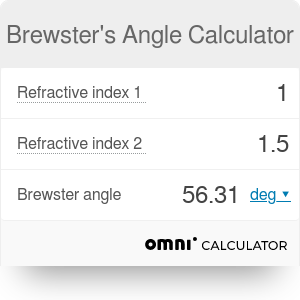 Brewster's Angle Calculator can be embedded on your website to enrich the content you wrote and make it easier for your visitors to understand your message.